Last night, young women packed the Onyx Room at the Park Hyatt Hotel for a panel discussion hosted by Real Simple and Time magazine. 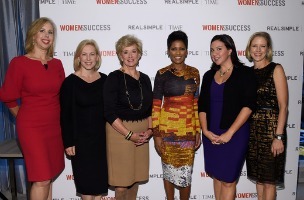 The “Women & Success” panel was an extension of a poll the magazines did on women and their sentiments towards success. To kick off the night, Time’s managing editor Nancy Gibbs interviewed Senator Kirsten Gillibrand, who spoke candidly about the “jerks” she’s run into who talked more about her appearance than her legal prowess, the lack of an effective women’s movement right now, and how women can mentor each other. Guests received a copy of her new memoir Off the Sidelines. 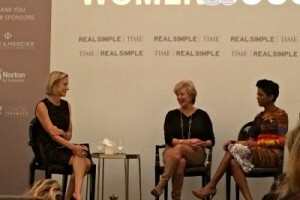 Later, Real Simple editor Kristin Van Ogtrop moderated a panel with the WWE’s Linda McMahon, MSNBC’s Tamron Hall, and Kristen Anderson-Lopez, who joked that she’s OK with being known as the woman who wrote the Frozen song. It was a lively, hour long conversation about figuring out what to do with your life, overcoming failure, and why ‘having it all’ might be a bad idea. Did you know that Hall once worked under the table for Joe Frasier corralling boxers into practice? Every NYU student in the room breathed a sigh of relief. It’s going to be OK.
After a round a of questions from the audience, the evening concluded with a cocktail hour — Real Simple-esque pink cocktails with berries.